This week, while looking at the performance of the MoS twins and the TAB and Centrebet bookmakers, I noticed that all four had better mean absolute errors (MAEs) in their forecasts for Away teams compared to those for Home teams (see the bottom of this post). At this point, the forecasters have had MAEs for their Home team score predictions of about 18 to 18.5 points per game, and MAEs for their Away team score predictions of about a point per game less. That would suggest that, at least in terms of this metric, Away team scores have been easier to predict this season - or have carried less information - than have Home team scores. This is consistent with what we found back in 2012 when we used the MINER package to measure the correlations between various football metrics, including that between the final margin and Home team scores, and the final margin and Away team scores. We found there that the Home team score carried more information about the final margin than did the Away team score. Still, I thought it was probably time to revisit the topic to see how historically persistent this phenomenon has been. For today's analysis I'll be using MoSHBODS' team scoring predictions (including the two-point deduction for designated Away teams, which serves to reduce the bias in MoSHBODS' forecasts for those teams, as discussed in that same blog). I'll also be determining a team's venue status - whether it is playing with or without a Home Ground Advantage, according to MoSHBODS - independently of the AFL's designation of the team. Specifically, whichever team MoSHBODS believes has a net positive Venue Performance Value will be deemed to be the Home team. In those games where the Venue Performance Values net out at zero (ie because neither team has played sufficient games at the Venue), both teams will be deemed to be playing at a Neutral Venue. Using those definitions and looking only at games from the home-and-away part of each season, we come up with the following picture of MAE per game for Home, Away and Neutral teams by season. It's clear that MAEs for Away teams are generally lower than MAEs for Home teams. In fact, the MAE has been lower in almost 82% of seasons since 1897 (though not, if we look only at recent seasons, in 2012, 2014 and 2016). Broadly speaking then, MoSHBODS has been more accurate in forecasting Away team scores than Home team scores in absolute terms. But, given Venue Performance Values for our newly-designated Home teams are, by definition, positive, we'd expect our average forecast Home team scores to be higher than our average forecast Away team scores. The chart below confirms this, and the gap between the green and red lines provides a measure of the average HGA across time according to MoSHBODS. We might ask then: are MAEs as a percentage of expected score lower or higher for Away teams? It turns out that, in percentage terms, Away team score forecasts are generally less accurate than Home team score forecasts. In almost 70% of seasons, the MAEs for Away teams expressed as a percentage of their expected score are higher than the equivalent metric for Home team scores. 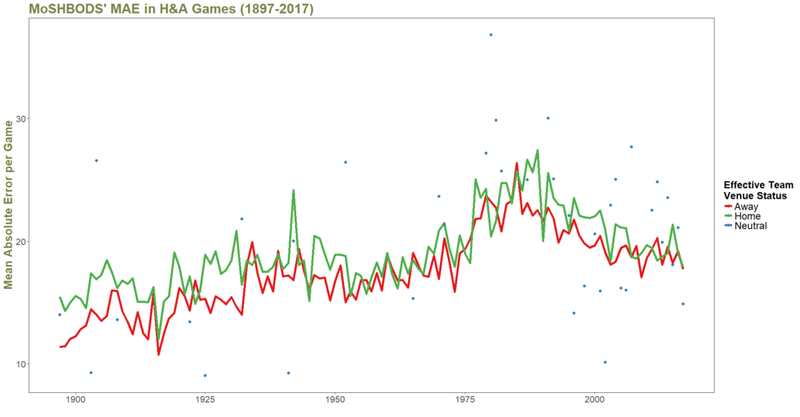 In absolute MAE terms, Away team score forecasts are more accurate than Home team score forecasts (by about 1.6 points per game per season across the entire history of the V/AFL and about 0.9 points per game per season since 2000). In relative MAE (ie MAE as a percentage of expected score) terms, Away team score forecasts are less accurate than Home team score forecasts (by about 1.6 percentage points per game per season across the entire history of the V/AFL and about 1.3 percentage points per game per season since 2000). For most purposes, the absolute MAE errors are likely to be the more important metric, though relative MAEs might occasionally be pertinent.